Hello January, and hello 2018. 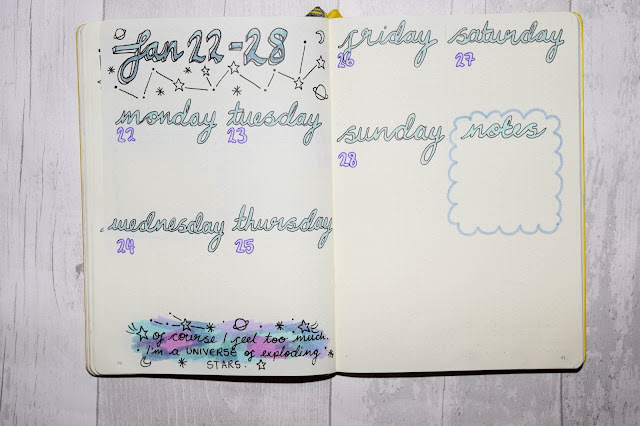 There's nothing I like better than starting fresh and with a bullet journal, my favourite thing is starting fresh every month with a new set up and a new theme. 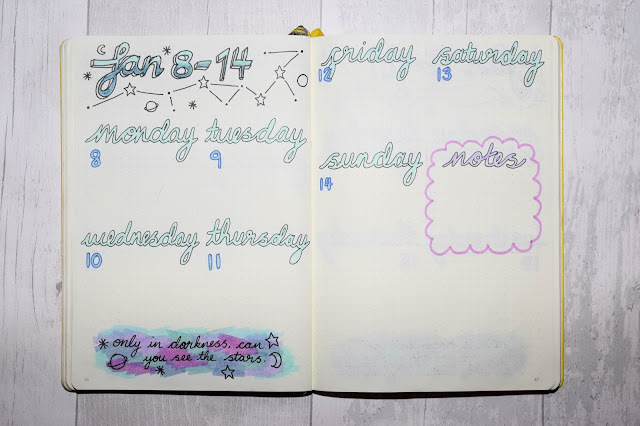 For my first bullet journal set up of the year, I went with a galaxy theme. 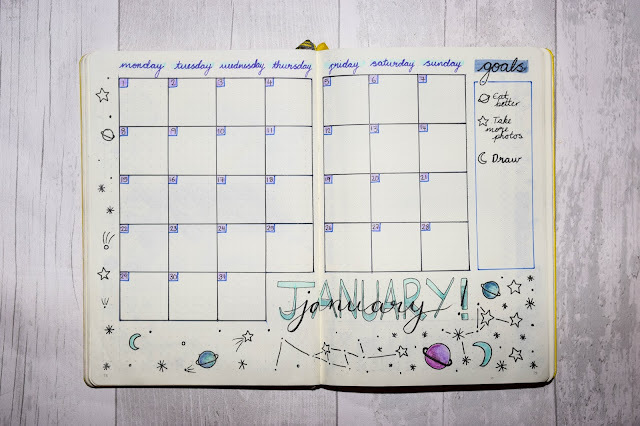 This theme was influenced by a couple of bullet journal Youtubers and their January set ups along with a couple of pictures I came across on Pinterest. I love this theme and I love how January is looking. As you can see, I started off with my favourite double page spread: a quote and the month's intro page. The quote came from Youtuber ChristineMyLinh and the way I've written my calligraphy this time was inspired by Christina (My Life In A Bullet). They collaborated for this month's set up which I thought was lovely! You should follow them both. Last month, I liked how joining the boxes helped me plan things that ran over time. I highlighted a line at the bottom of the days if something ran over a few days and as well as it helping me organise life, it looked good. This time, with the 1st January being on a Monday, I changed the set up a little bit and went with the January title at the bottom. I kept my monthly goals side bar and just decorated the page a little bit in the empty spaces. I didn't want anything else on this page - not for this month at least. The habit tracker worked so well for me last month and was actually my most used and favourite page. So much so that I bought it back with a couple of changes. This time, I've spread it over two pages and added more to it. 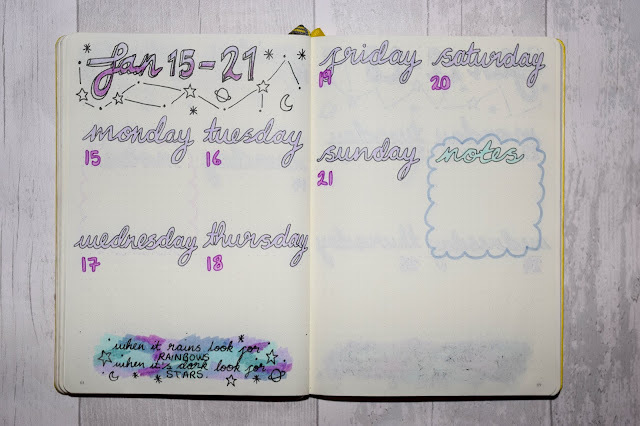 I saw a tracker I liked online that looked like constellations when it was finished so I used the idea to created my own tracker. And then because the line graph was so successful (because I used it everyday), I did it again except I took exercise off it and put it in the tracker above. I felt like exercise didn't work in this tracker and would work best tracked with just a star than a time scale. I'm really excited about these two pages. This month, I am looking to be more sentimental and grateful which explains both these pages. In my best friend Ana's bullet journal she did the memories page and it looks amazing. 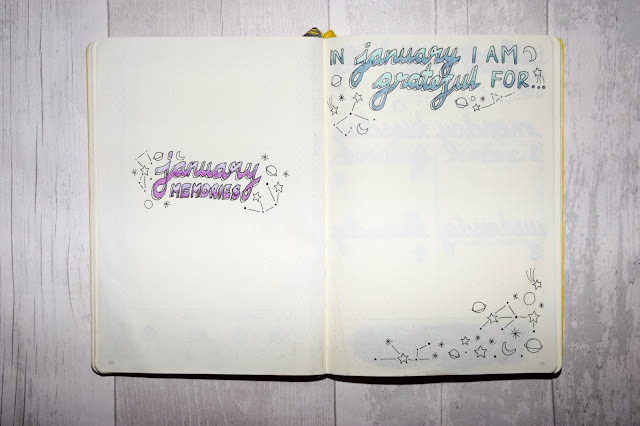 It reminds her of all the good things and I wanted to do that too so I took that idea and did it myself, that way I can keep January memories in one place. Things like quotes, dates and maybe even some photos! That's something I want to start adding to my journals - photos and stickers. The grateful page is for all the things I'd be grateful about this month whether it is a cup of tea on a cold day or having a bath after a long day. It's for anything big or small like that. January's weekly spreads aren't my favourite now that I look back. 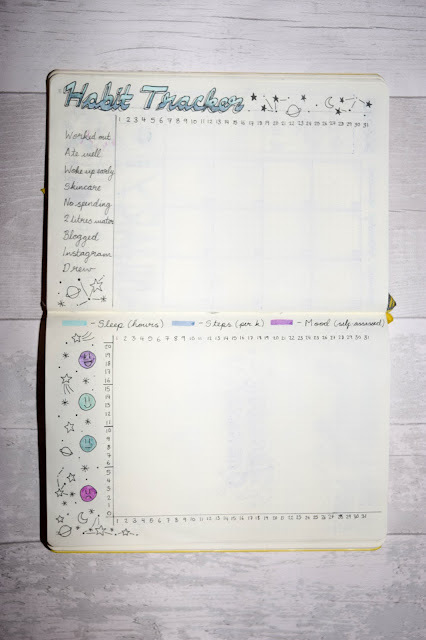 I took the idea for this spread from a photo I saw on Pinterest and though it looks cute and lovely, I don't think it's entirely practical for me. I'm just not feeling not having any lines or anything like that. It feels a bit up in the air so I might still add something like constellation lines joining stars at the corners. 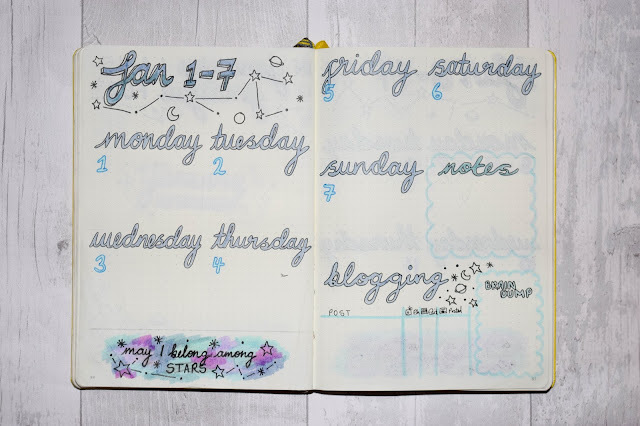 I did have every day of the week un-outlined but it looked weird so I went back to it and outlined everything. It took a while but it was worth it because it definitely made it look better. You might be able to notice that there's a blank space at the bottom of each page too and that's because I was unsure of what to do with it. I wanted to do something like track Instagram and blog posts but then I remembered the trackers and didn't want double that up. I then thought about something to do with blogging so I set up what I have in the first week to trial. If I like using it or use it at all, I'll draw it on the other three weeks, but for now I'm going to leave them blank. I thought it might be a nice way to track the posts I want to write and whether I've photographed it, written/edited the post and published it. I'm hoping I like it but I don't know just yet. 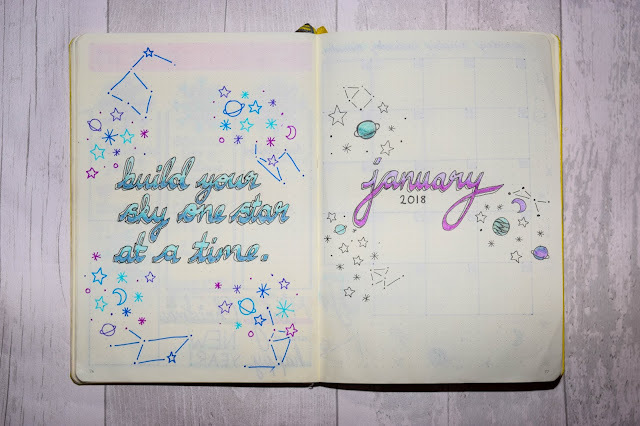 Last month I really liked the quote on each week, so I did it again but this time with motivation quotes related to stars and space to fit with the galaxy theme! It gave me the opportunity to add a splash of colour to each page with the background too. And that's it! My January set up. What I love about a bullet journal is that it's creative and if you don't like a theme, you know you only have it for a few weeks. I also love that it's personalised and you can learn from your mistakes and change it according to them. That's why the mistakes are actually a good thing with bullet journals! I hope you like January's set up and please send me pictures of yours or links to your posts about your set up too because I'd love to see them. Please let me know what you think of these posts. I love writing them and sharing my creative side with you. I'd love to know your thoughts.